Disney has added the "Fantasmic" and "World of Color" nighttime spectaculars to the MaxPass system which lets visitors book FastPass attraction times via a mobile app at its two Anaheim theme parks. The $15 up-charge MaxPass system works with the free FastPass systems to allow visitors to set up return times for popular attractions in Disneyland and Disney California Adventure. The popular nighttime spectaculars draw thousands of people nightly for shows featuring video projections on water mist screens. 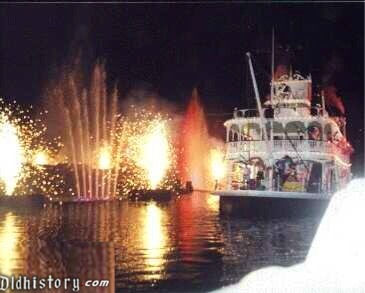 "Fantasmic" plays on the Rivers of America in Disneyland while "World of Color" is performed on Paradise Bay in Disney California Adventure. The digital MaxPass ride time scheduling system is part of the Disneyland app, which serves as a repository for admission tickets, restaurant reservations and mobile food orders. The app's interactive digital park map shows real-time attraction wait times, show times and ride closures. The app ties into Disney's PhotoPass service so visitors can collect all their character snapshots and on-ride pictures. A separate Play Disney Parks app uses GPS location data and mobile notifications to let visitors earn achievement badges, listen to Disney songs, answer trivia questions and play attraction-inspired games while waiting in line or wandering the park. The Anaheim parks use the smartphone apps to help manage the crowds that line up for attractions, shows and restaurants and keep visitors entertained while they wait in those queues. Tying all that activity to a mobile phone allows Disneyland to track visitors at various touch points throughout the park as the they check in with FastPasses, pick up food orders or make dinner reservations. The popular FastPass system allows visitors to book return times in advance for their favorite attractions and wait in a shorter lines at a prescribed time. At Disneyland, the FastPass-enabled attractions include Big Thunder Mountain Railroad, Buzz Lightyear Astro Blasters, Haunted Mansion, Indiana Jones Adventure, It's a Small World, Matterhorn Bobsleds, Roger Rabbit's Car Toon Spin, Space Mountain, Splash Mountain and Star Tours. The Disney California Adventure FastPass attractions include Goofy's Sky School, Grizzly River Run, Guardians of the Galaxy - Mission: Breakout!, Incredicoaster, Radiator Springs Racers, Soarin' Around the World and Toy Story Midway Mania.